Heavy snowfalls and record low temperatures have hit Britain in the last week and many people have felt 'besieged' in their own homes, unable to get out and about. However, the experience of being 'besieged' in winter in the 21st century bears little resemblance to what was endured in medieval times. One instance in particular comes to mind ... the winter of 1141 and the predicament that Matilda, daughter of King Henry I of England, found herself in. Matilda was by rights the next ruler of England but Stephen of Blois had taken the throne for himself following the death of King Henry I whilst Matilda was in France (confined with her third pregnancy). Matilda's loyalty to her father and his wish that she and her son(s) would one day rule England left her no choice but to challenge Stephen. So she travelled to England and embarked upon a campaign against him. 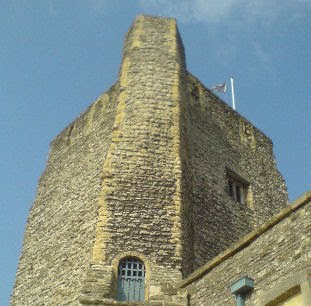 By December 1141 Matilda had retreated to the medieval castle at Oxford and Stephen marched his men unexpectedly from Bristol to attack Oxford in an attempt to capture Matilda. Oxford Castle was a well defended stronghold (read more about castle defence) so taking it by force in the middle of winter was not a viable option. Stephen chose instead to lay siege to the castle and wait for Matilda's supplies to run out over the winter months. Matilda's response, however, was not what Stephen expected. She formed and executed a daring and hazardous plan ... just before Christmas she slipped quietly out of a side door in the castle with just three of her trusted soldiers. 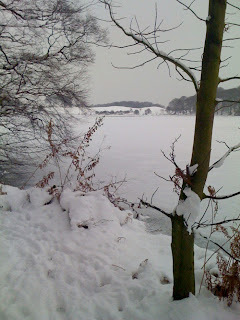 They were all dressed in white capes so as to blend into the landscape which was covered in thick snow. The stream nearby had to be crossed in order to escape and the fact that it was frozen over was to her advantage for it bore the weight of her small party and they managed to get away quietly and reach safety some miles away in Abingdon. So how cold and frightening must Matilda's escape have felt? Those few hours on that December night 869 years ago must have been an experience Matilda never forgot. So when you are next drinking your mug of cocoa, wrapped in a warm blanket and lazily reading a book by the fireside on a snowy winter's evening ... spare a thought for the brave Matilda!